SUPPORT YOUR NEIGHBORS! PROTECT THE FIRST AMENDMENT! 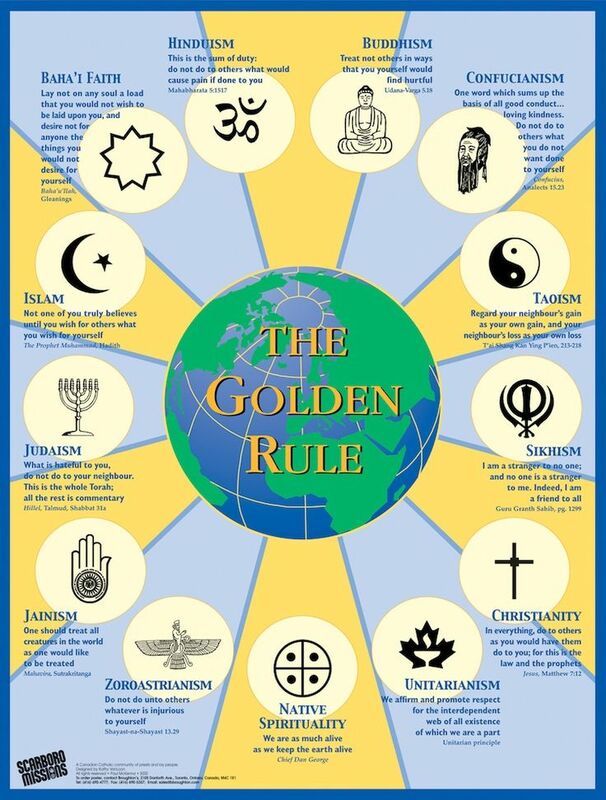 “Out of love and zeal for clarifying the truth,”* and the need to protect the sanctity of our religious beliefs, each religious community should discuss the following items prior to surrendering an important religious right to a Pharmaceutical Industry marketing campaign. The Pharmaceutical Industry currently seeks to remove religious freedom in multiple states. 1. 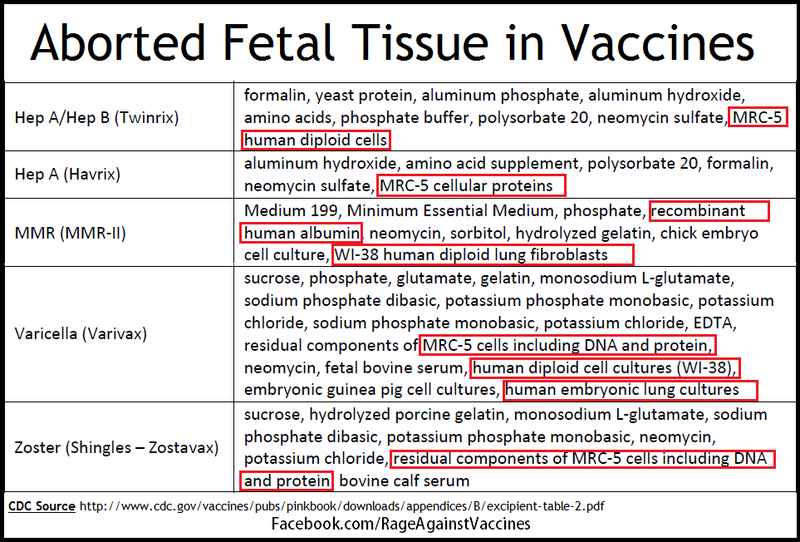 Production for some vaccines involves use of aborted fetal cells. 2. 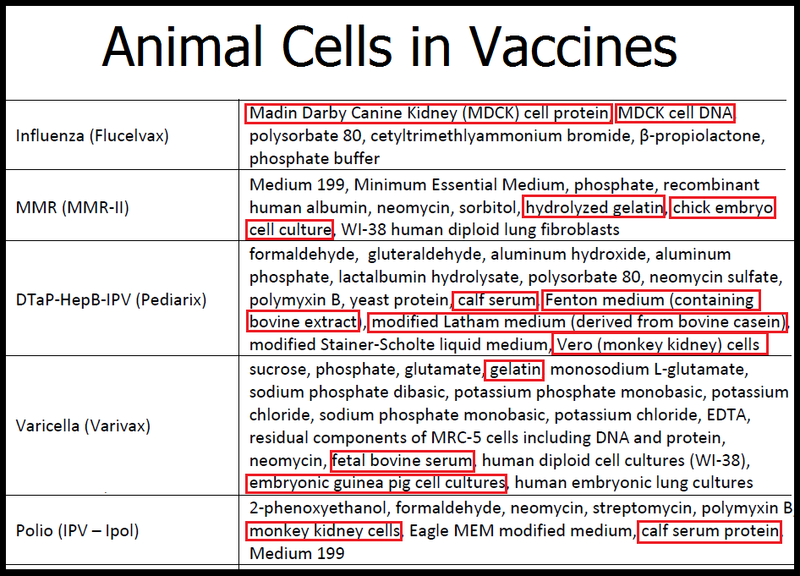 Vaccine manufacturing production involves the use material from other species (cows, pigs, chickens, monkeys, etc) creating the potential for contamination with the DNA of other species. 3. The 6th Commandment is Thou shalt not kill. Vaccines can kill. More than 600 vaccine deaths have been compensated under Vaccine Injury Compensation Act. The potential connection between vaccination and SIDS has never been adequately studied. 4. 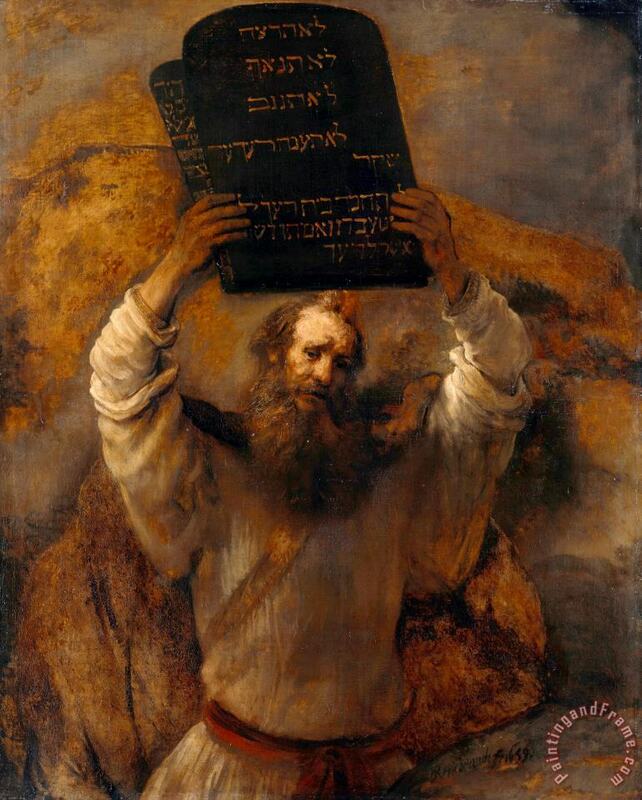 The 5th Commandment instructs society to honor thy father and thy mother. Substituting the beliefs of “the state” over the religious beliefs of parents dishonors them in violation of the 5th Commandment. 5. 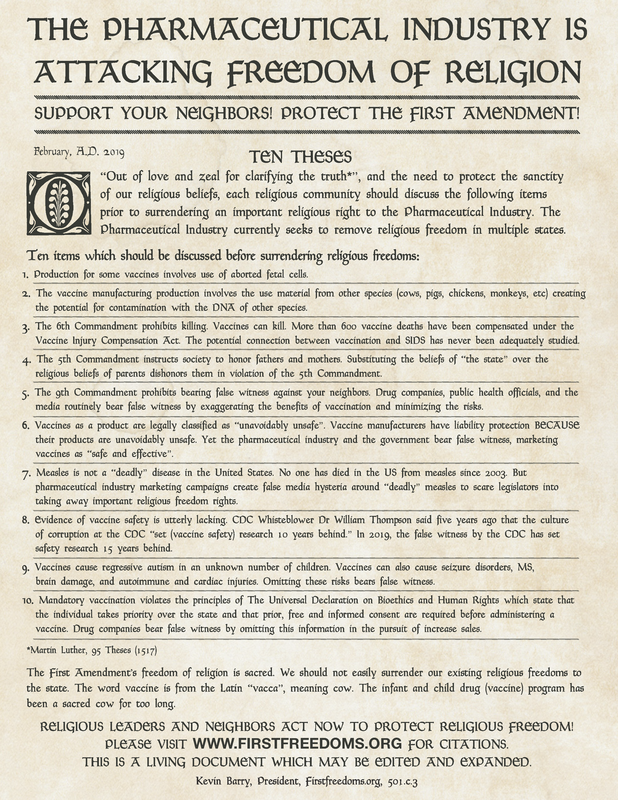 The 9th Commandment prohibits bearing false witness against your neighbors. Drug companies, public health officials, and the media routinely bear false witness by exaggerating the benefits of vaccination and minimizing the risks. 6. Vaccines are legally classified as “unavoidably unsafe”. Vaccine manufacturers have liability protection BECAUSE their products are unavoidably unsafe. Yet the pharmaceutical industry and the government bear false witness, marketing vaccines as “safe and effective”. 7. 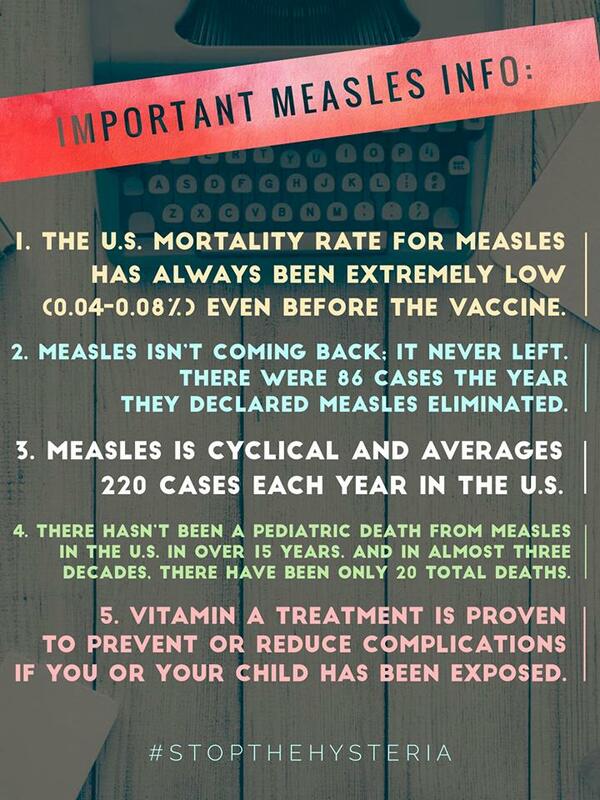 Measles is not a “deadly” disease in the United States. 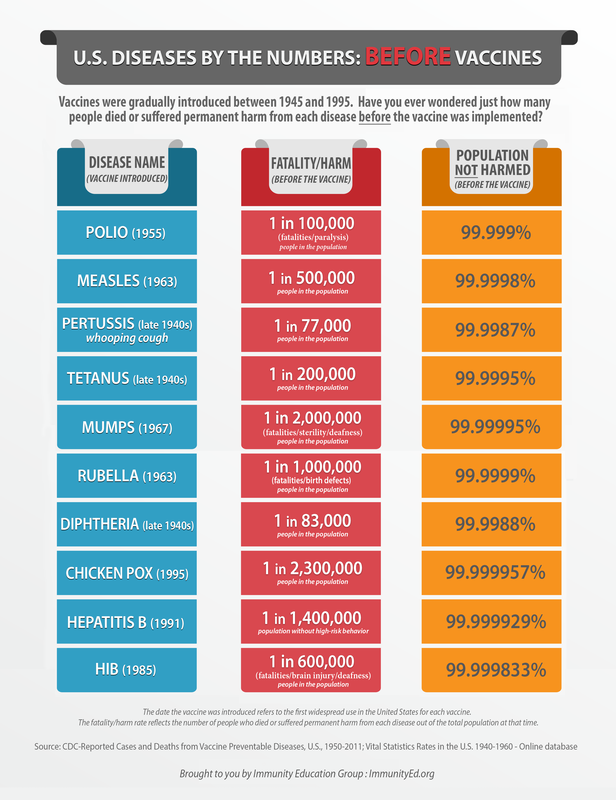 No one has died in the US from measles since 2003. But pharmaceutical industry marketing campaigns create false media hysteria around “deadly” measles to scare legislators into taking away important religious freedom rights. 8. Evidence of vaccine safety is utterly lacking. 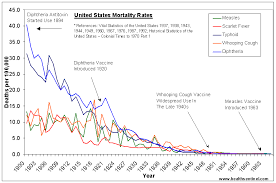 Five years ago CDC Whisteblower Dr William Thompson said that the culture of corruption at the CDC “set (vaccine) research 10 years behind.” In 2019, the false witness by the CDC has set safety research 15 years behind. 9. Vaccines cause regressive autism in an unknown number of children. Vaccines can also cause seizure disorders, MS, brain damage, and autoimmune and cardiac injuries. Omitting these risks bears false witness. 10. 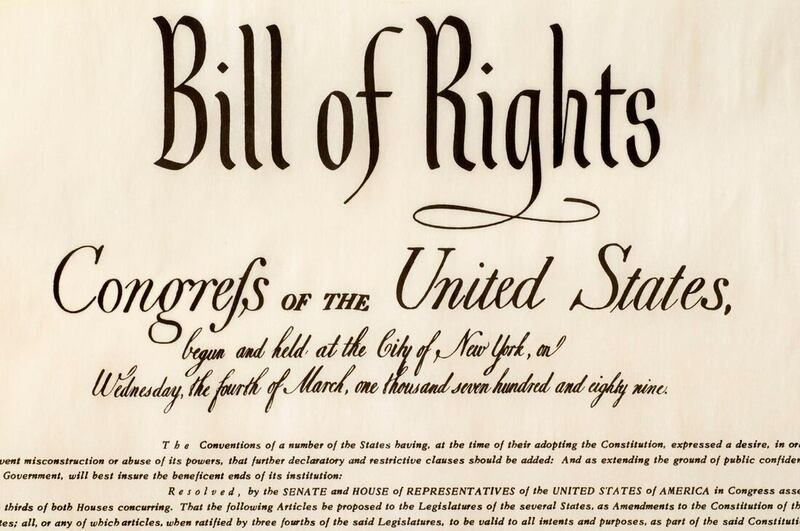 Mandatory vaccination violates the principles of The Universal Declaration on Bioethics and Human Rights, which states that the individual takes priority over the state and that prior, free and informed consent are required before administering a vaccine. Drug companies bear false witness by omitting information about known side effects and biotheics standards in the pursuit of increased sales. 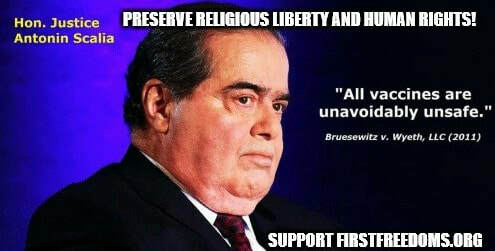 The First Amendment’s freedom of religion is sacred. We should not easily surrender our existing religious freedoms to the state. The word vaccine is from the Latin “vacca”, meaning cow. The infant and child drug program, often called the vaccine program, has been a sacred cow for too long. THIS IS A LIVING DOCUMENT WHICH MAY BE EDITED AND EXPANDED. Human dignity, human rights and fundamental freedoms are to be fully respected. The interests and welfare of the individual should have priority over the sole interest of science or society.